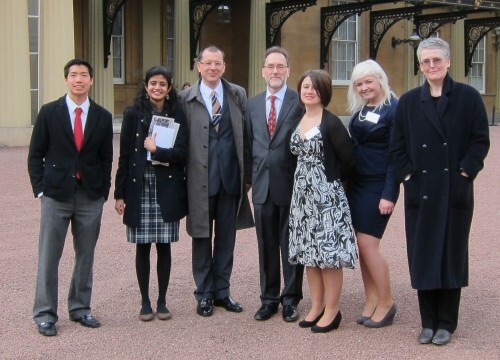 We weren’t allowed to take photographs inside the Palace, so here are staff and students in the courtyard, still in a daze after the splendid ceremony and being presented to the Duke of Edinburgh (who, it can be revealed, likes his iPad because the type is big enough to read). From left to right: Edward Liu (MA Information Design), Pooja Saxena (MA Typeface Design), Eric Kindel, Paul Luna, Jeanne-Louise Moys (PhD student), Hannah Smith (BA Graphic Communication, Part 3), Sue Walker. Jake Giltsoff (BA Graphic Communication, Part 2) escaped before the picture was taken.